They’re designed to be effective at an unknown time in the future, which both parties hope never occurs. In fact, in a weird twist of logic, marital agreements only have a presumption of validity if they are in contemplation of an ongoing marriage, the opposite of the event in which it would go into operation. While the agreement must have some semblance of “fairness,” there’s no definition provided of what that term means. Clearly, the agreement does have to replicate a property division as if there was no agreement. In addition, if circumstances change after the date of execution of the agreement, fairness must be reassessed at the time of application. And, of course, circumstances will have changed. Life does go on, after all. Two recent Court of Appeals cases found that changes of circumstance caused agreements to be unenforceable at the time of divorce. While neither case was published, they’re both authored opinions and therefore may be cited for their persuasive value, pursuant to Wis. Stat. §809.23(3). In Zernia v. Zernia, No. 2012AP838 (Ct. App. 2013), the District 4 appellate court reversed La Crosse County Circuit Judge Todd Bjerke’s ruling enforcing a premarital agreement. Judge Joanne Kloppenburg’s opinion for the panel, released in February, held that the wife’s departure from the workplace, her contributions to homemaking and child care, and her inability to independently support herself financially were unforeseen circumstances. In addition, the court noted the parties’ general lack of adherence to the agreement. As a result, the court held the agreement’s terms were inequitable to the wife, thereby rendering the entire agreement unenforceable. Prenuptial agreements frequently specify how the parties intend to handle their finances during the marriage. Then, life intervenes and the agreement may — or may not — be followed. In addition, leaving the workforce to take care of children hardly seems to be an unforeseen circumstance for a woman getting married. Rather, for many marriages, having children and taking care of them are quite well contemplated. More recently, in Hartford v. Hartford, No. 2012AP1911 (Ct. App. 2013), the appellate court upheld a trial court ruling that disregarded a prenuptial agreement. 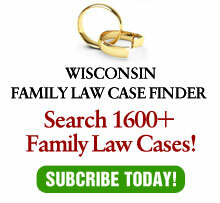 The opinion, once again penned by Kloppenburg and released in August, concluded that Racine County Circuit Judge S. Michael Wilk properly exercised his discretion when he determined that allowing the husband to keep property acquired after the marriage as non-divisible property wasn’t in line with the wife’s reasonable expectations, and that the agreement was therefore inequitable and not binding upon divorce. According to the trial court, the wife didn’t expect that her husband would convert his business from a C-Corporation to an S-Corporation or that he would invest in additional businesses that became associated with his main business. With no disrespect to the wife, my guess is that she had no contemplations at all regarding her husband’s operation of his business. In all likelihood, she didn’t sign the agreement — or get married — with any expectations regarding the eventual tax options that her husband might select. As previously noted, while both of these cases only can be cited for their persuasive not precedential value, it’s easy to contemplate that virtually every marriage will have similar changes in circumstances. Businesses make elections all of the time. Women have babies and sometimes choose to leave employment and devote themselves to child care. One way to avoid having an agreement become non-effective would be for parties to revise their agreement from time to time based on new circumstances. But that’s unlikely to happen. I can’t speak for other marriages, but any conversation I might have with my wife that would start with, “Let’s talk about what happens if we get divorced,” is unlikely to have a happy ending. As a result, the agreement typically sits in a drawer and is ignored until it’s needed. Absent a better definition of what changes in circumstances would nullify an agreement, this is a ripe area for litigation. Lawyers who draft such agreements need to advise their clients that if circumstances change, the agreement might become meaningless. And, since circumstances are always changing, are these agreements really helpful, after all?